^ 英: Elements are not tags. ^ Raggett, Dave (1998). Raggett on HTML 4. Addison-Wesley. pp. chap. 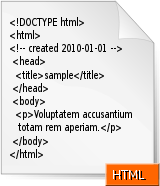 2: A history of HTML. ISBN 0-201-17805-2. http://www.w3.org/People/Raggett/book4/ch02.html.